VersaGuard42 - with InnerCreteTM Membrane Technology, modifies the	concrete to create a permanent	and consistent membrane from 1mm to 3mm below the surface and retains the surface profile. 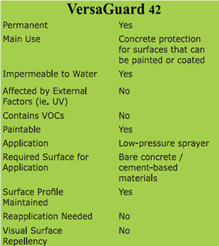 This proprietary technology creates an impermeable barrier that is the most effective solution to permanently protect concrete and other cement-based materials from coating delamination, water penetration, hairline cracking, surface abrasion and erosion, stains and odours, micro-organism growth, efflorescence, dusting, chemical attack and other destructive environmental elements. VersaGuard42 provides complete versatility. The concrete mass remains permanently protected by the internal InnerCreteTM Membrane that is created yet the surface retains its	profile for coating / paint application if desired. 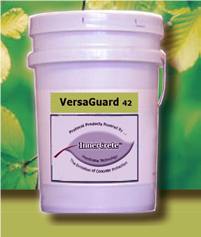 There is no visible change to the appearance of the concrete once treated with VersaGuard42. VersaGuard chemically modifies the concrete to create a permanent, integral and consistent waterproofing membrane from 1mm to 3mm below the surface. The surface profile is maintained, so can be painted or coated with optimal adhesion or left with its natural finish. VersaGuard provides complete waterproofing protection and versatility and eliminates the need for traditional sealants or coatings. 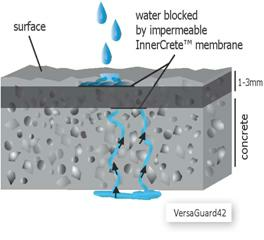 VersaGuard42 maintains concrete breathability while improving durability and reducing maintenance requirements. The information contained in this Technical Data Sheet (TDS) is correct as of the day issued. Global Safe Technologies Australia T/as Anti-Slip Anywhere as Distributor and Protocol Environmental Solutions Inc (Protocol) as manufacturer makes no other representation, warranty or guarantee of any kind, expressed or implied, statutory or otherwise, including without limitation in respect of merchantability, merchantable quality, durability, fitness for a particular purpose, course of performance or usage of trade, howsoever arising. The user is responsible for determining whether the Protocol's product is durable, fit for a particular purpose or suitable for the user's method of use or application. Given the variety of factors that can affect the use and application of a Protocol product, some of which are uniquely within the user's knowledge and control, it is essential that the user firstly evaluate the Protocol product to determine whether it is fit for a particular purpose and suitable for the method of use or application.